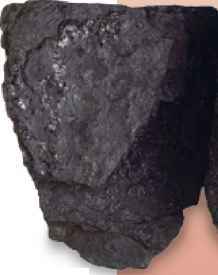 Carbon exists in pure form as graphite—the "lead"in a pencil, for example—and diamonds. Yet if it combines with oxygen, it forms carbon dioxide gas, and with hydrogen it forms methane. 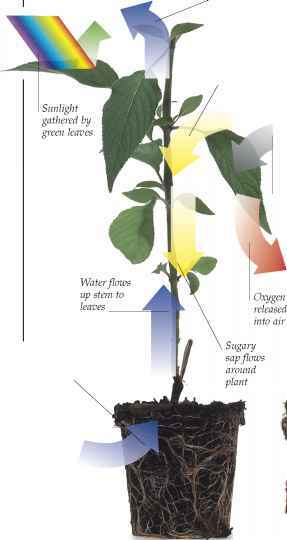 Green plants use carbon dioxide to make food. 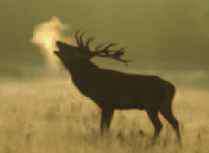 They absorb it from the air, and use the Sun's energy to combine it with water to make a carbohydrate, sugar. Sugar stores energy, and if it is combined with oxygen, the energy is released to fuel life processes. This reaction also turns the sugar back into water and carbon dioxide, which pass back into the atmosphere. Carbon dioxide is also released through burning and decay, absorbed and released by ocean water, locked up in limestones that form on shallow sea floors, and erupted from volcanoes. So carbon is always passing between living things, the atmosphere, oceans, and rocks, in an exchange called the carbon cycle. Plants and animals use oxygen to release the energy stored in sugar and other carbohydrates. Known as respiration, this turns the sugar back into carbon dioxide and water. Animals breathe in the oxygen, and breathe out to lose carbon dioxide and water vapor, which is often visible on a cold day. 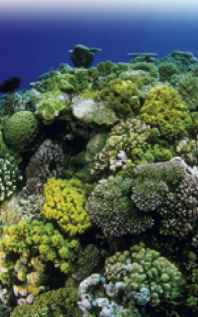 Green plants and marine plankton use solar energy to turn carbon dioxide and water into sugar. This process, which is called photosynthesis, also releases oxygen. Sugar stores the energy of the Sun in chemical form, and nearly all living things on Earth rely on this energy to build their tissues and fuel their activities. Life is built on carbon. 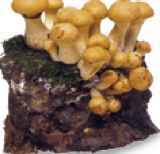 When living things die, other living things such as these fungi and bacteria start recycling their basic ingredients. This process of decay often combines the carbon in the dead tissues with oxygen, so it returns to the atmosphere as carbon dioxide. Another type of decay combines the carbon with hydrogen to form methane. CARBON STORAGE When a plant or animal dies, it usually starts decaying right away, and its carbon content soon returns to the air. But sometimes it is buried in such a way that it does not decay properly. Dead plants that sink into a waterlogged bog often do not rot away, but turn into deep layers of peat. Eventually the peat may be compressed into coal, a process that stores the carbon for millions of years instead of for the lifetime of the plants. 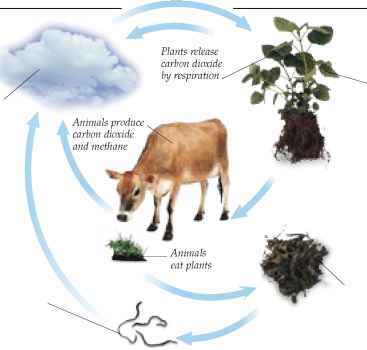 THE CARBON CYCLE Carbon is constantly being absorbed and released by living things. Plants and other photosynthesizers absorb carbon dioxide and use some of the carbon to build their tissues. The carbon is released as carbon dioxide or methane when plants die and decay. If animals eat the plants, they use some of the carbon to build their own tissues, but eventually die too. Meanwhile both plants and animals release carbon dioxide when they turn sugar into energy by respiration. Rain dissolves carbon dioxide from the air to form weak carbonic acid. 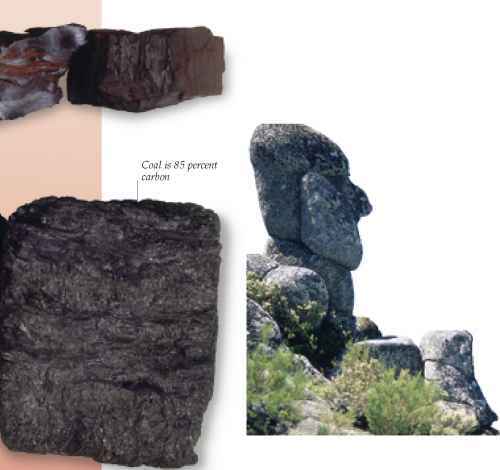 Where rain falls on silicate rocks such as this granite, the carbon combines with the silicates to form carbonate minerals. These are carried away in rivers to the ocean, where they are taken up by marine organisms. When these die, their remains sink to the sea bed where they may form limestone, locking up the carbon for millions of years. Carbon stored in the rocks of Earth's crust is returned to the atmosphere by volcanoes. 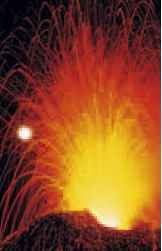 Explosive "fire fountains"like this one on Mount Etna, Sicily, erupt both molten rock and gases, which include carbon dioxide released by carbonate rocks such as limestones as they melt. A lot of carbon dioxide erupts from volcanoes every year, but in the long term, this is absorbed by the formation of more carbonate rock. During Earth's early history, 3.5 billion years ago, the Sun was radiating far less energy than it does now. 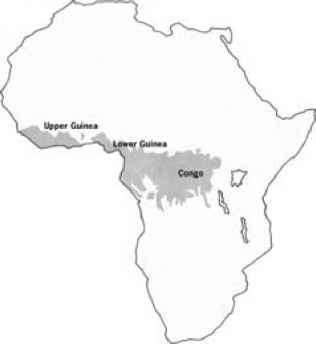 However, vast amounts of carbon dioxide erupting from huge volcanoes created an intense greenhouse effect that stopped Earth from freezing, and this enabled life to evolve. Over time the Sun increased its output, but most of the atmospheric carbon dioxide was soaked up by the oceans, reducing the greenhouse effect at roughly the same rate. Some scientists see this as evidence that, in the long term, Earth is a self-regulating system.